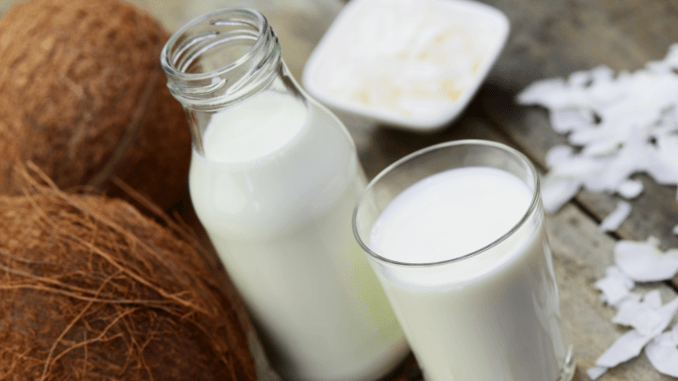 A recent report on developments in the coconut milk market from 2016 to 2024 promises industry growth due to the rapidly increasing vegan population. The health benefits of consuming coconut milk are also being appreciated by an increasing number of consumers. Coconut milk is obtained from the grated meat of the coconut and has a high oil content. It has properties which have a positive effect on the immune system and prevent diseases from occurring. The lauric acid in coconut milk is effectively absorbed by the body and provides energy. According to the report, the consumption of coconut milk and other coconut products is expected to increase further in the forecast period 2016 – 2024. One of the most important growth factors is actually coconut’s health benefits, such as lowering cholesterol levels and reducing the risk of heart attacks and strokes. A further main driver is, according to the study, the steadily growing number of vegans. Here, it’s not just health that plays an important role, but also growing awareness of animal and environmental issues. Asian cuisine – which is very plant-based – is also enjoying increasing popularity around the globe, which offers growth opportunities for the coconut milk market. With regards to distribution channels, the report divides the coconut milk market into supermarkets, hypermarkets, specialist stores and convenience stores. In 2015, supermarkets and hypermarkets were the strongest segment and will probably be so again in the new forecast period. Geographically, the report is segmented into Europe, North America, Asia-Pacific, Latin America, the Middle East and Africa. North America has the largest share of the market, which was also the case in the previous reporting period. One of the reasons for this development is the growing number of lactose intolerant people in this region. The Asia-Pacific region is one of the fastest growing regions for the market due to its increasing share of the vegan population. The Middle East and Africa are also experiencing a growth spurt in the coconut milk market with the launch of new coconut milk-based products. According to the market report, the main players in the coconut milk market are Goya Foods, Pureharvest, WhiteWave Foods, McCormick and Theppadungporn Coconut Co Ltd. With regards to global producers, the report names Edward & Sons, Chi, Ducoco, iTi Tropicals, Thai Agri Foods, Turtle Mountain and Pacific Foods.